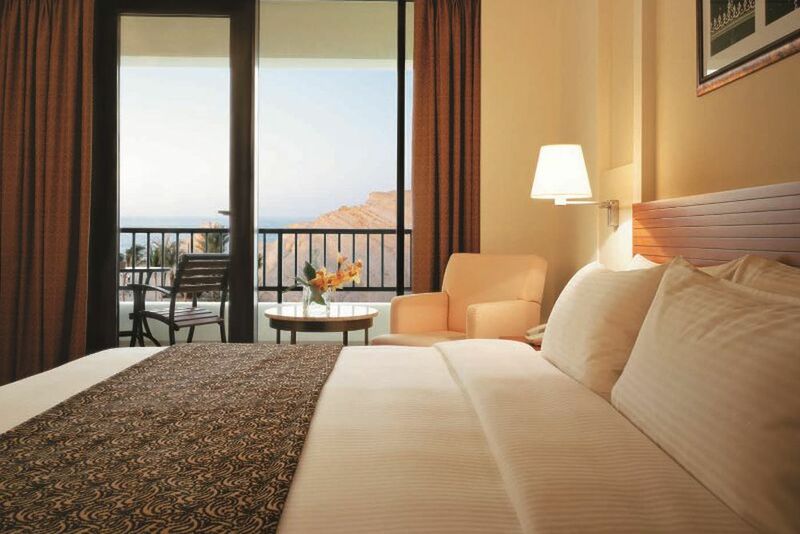 The luxurious Shangri-La's Barr Al Jissah includes three hotels: Al Waha, Al Bandar and Al Husn. View of Shangri-La's Barr Al Jissah. You can enjoy a wonderful view of the Gulf of Oman from the private balcony. The Executive Room is ideal for families. It also offers a seating area and a sofa bed. 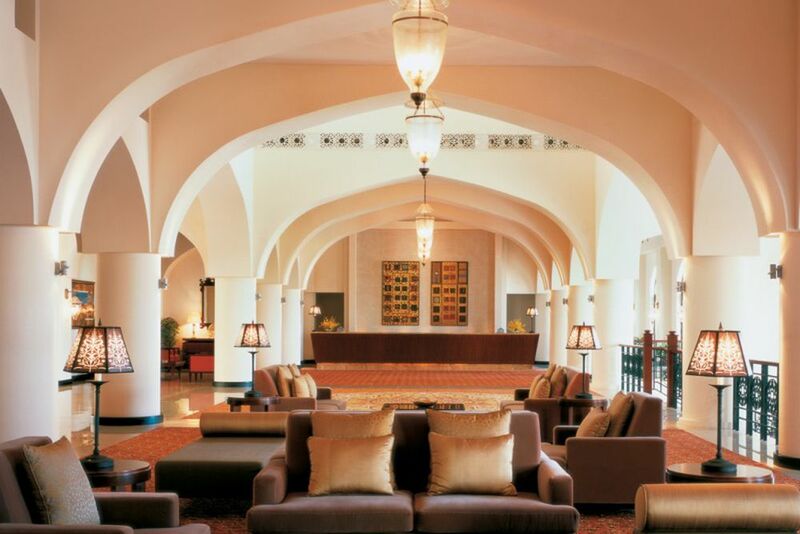 The imposing lobby of Al Waha. Relax with a cool drink at the spacious pool area. 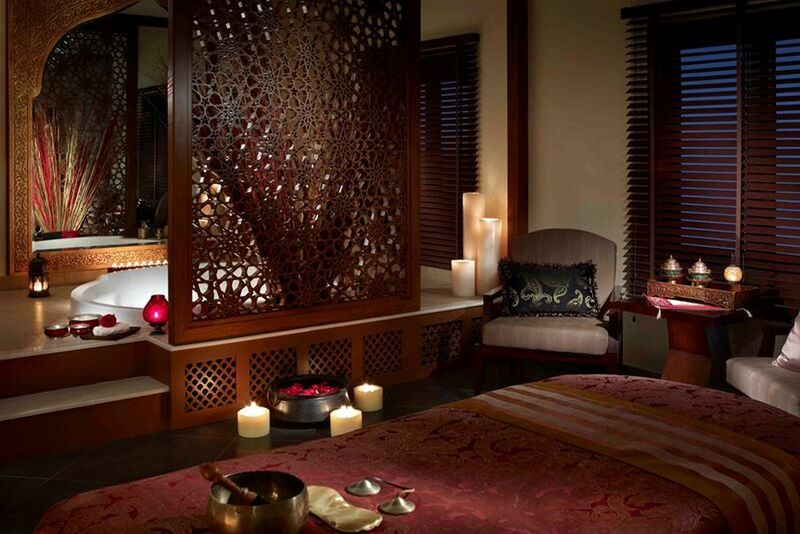 In the Chi spa area you can treat yourself to a Thai massage. In total, the stylish spa area includes 12 treatment rooms, a sauna, a steam room and a hot tub. You can watch turtles and accompany a turtle ranger on the beach. A great experience! 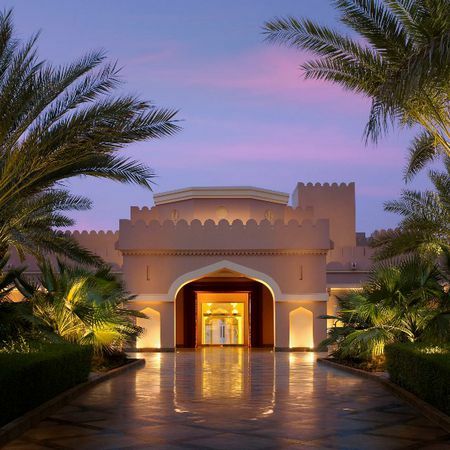 The largest of the three hotels at Shangri-La;s Barr Al Jissah Resort, Al Waha is Oman’s first dedicated family hotel that is a veritable oasis nestled amongst the mountains. Together with its sister hotel Al Bandar, AL Waha is located in the luxurious resort complex of Shangri-La Barr Al Jissah. Translated, Al Waha means "oasis", and the resort follows this name very literally. 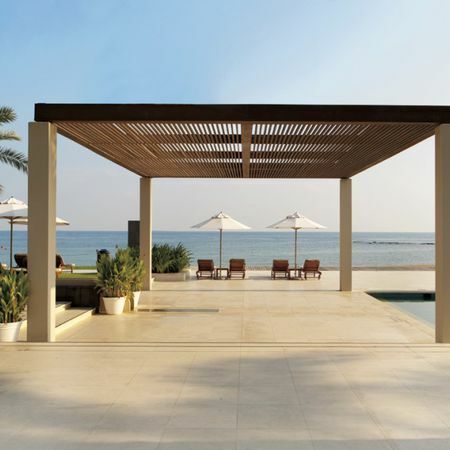 There is a 500-meter private beach on Barr Al Jissah Bay, and the resort’s spacious pool area offers plenty of relaxation and variety for the entire family. 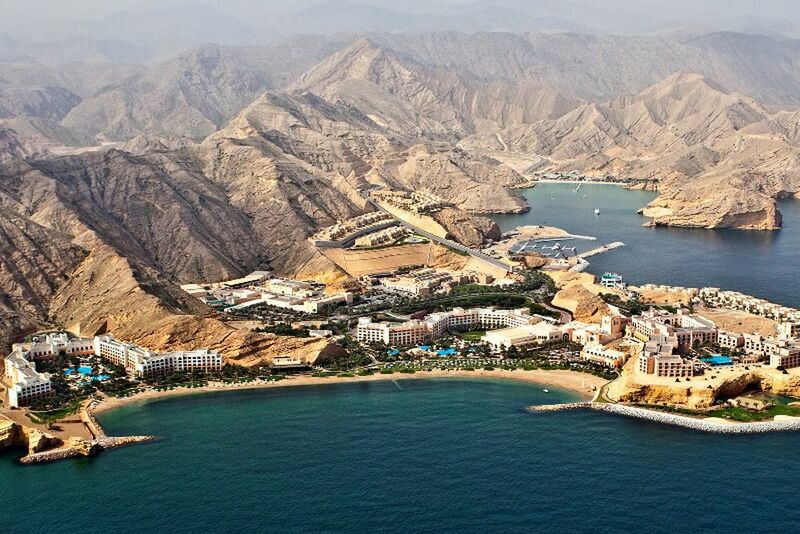 Overlooking the Gulf of Oman and the surrounding Haijar Mountains, Al Waha invites you to spend a relaxing holiday in the Middle East with your loved ones. Muscat’s Old Town. the popular market, and Mutrah Souk are about 15 minutes from Al Waha. The Muscat International Airport can be reached in about 45 minutes. The luxurious hotel group of Shangri-La Barr Al Jissah offers a total of 22 restaurants and bars that will spoil you with the culinary delights of international and local specialties. Look forward to delicious family restaurants, exclusive fast food restaurants, and world-class dinner. Guests can even visit every restaurant and bar in the sister resort as well. The Al Waha has two restaurants and two bars on site. At Samba Restaurant, visit the tequila bar or indulge in South African delicacies. The restaurant is open all day and pampers you with breakfast, lunch and dinner. At the exquisite fast food restaurant, Surf Cafe, you can try original burgers! The assira Pool Bar serves fresh salads, light sandwiches and small snacks. The Al Waha Lobby Lounge serves afternoon tea and fresh snacks. In the evening, fruity cocktails are served. Relax with a cool drink in the magnificent gardens or by the spacious outdoor pools. In addition to a 24-hour room service, the luxurious resort has a hairdresser, beauty salon and souvenir shop. The free shuttle bus takes you to Muscats Old Town and the popular shopping district in 15 minutes. There is endless fun and entertainment for the youngest guests, so even they will enjoy themselves at Al Waha! There is a childcare service, a kids club, an adventure zone and several playgrounds. In addition, the family-friendly resort offers children’s menus and a children’s pool where the little ones can let off steam. 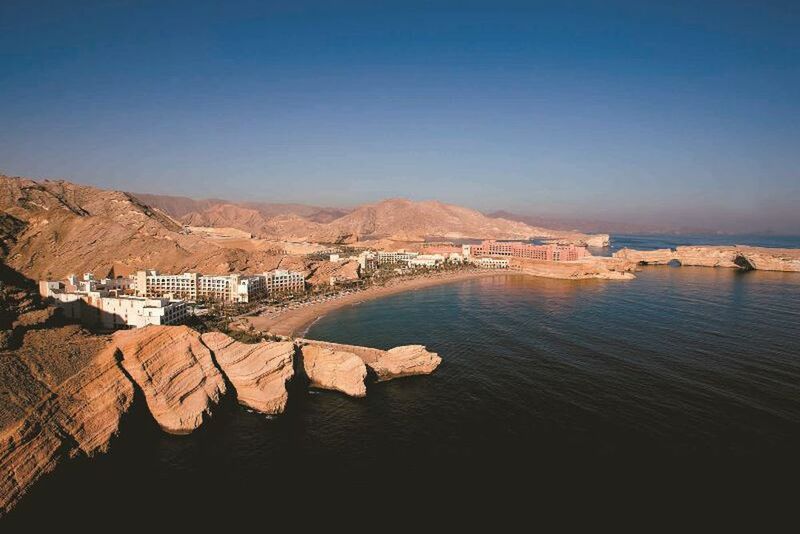 Al Waha has 262 rooms and suites, all with private balconies or patios. The spacious rooms and suites are decorated in a modern Arabic style and feature a private bathroom with separate bath and shower, bathrobes, slippers, toiletries, minibar, safe, satellite TV, and tea/coffee making facilities. Superior Room (32 sqm) - These rooms overlook the verdant gardens and the sparkling pool. For a maximum of 2 adults + 1 child up to 11 years, or 3 adults. Superior Sea View Room (32 sqm) - These beautiful rooms overlook the golden sandy beach and the glistening waters of the Gulf of Oman. For a maximum of 2 adults + 1 child up to 11 years, or 3 adults. 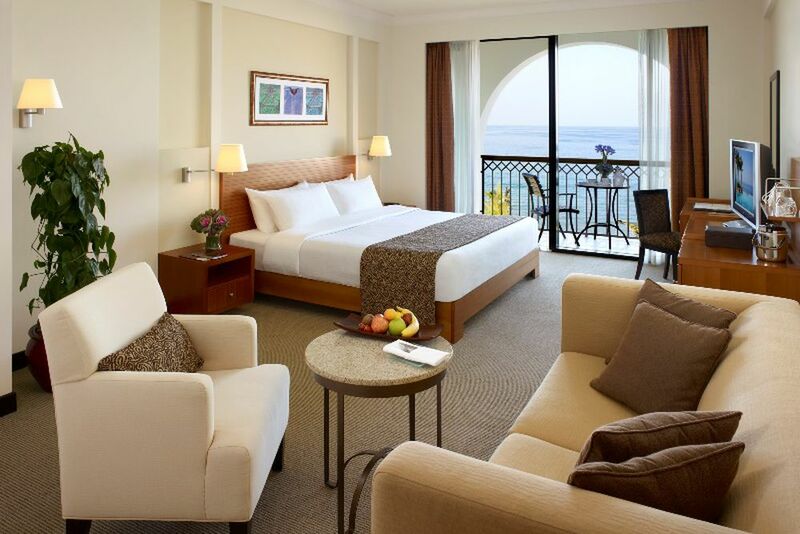 Executive Sea View Room (45 sqm) - Ideal for families, these spacious rooms overlook the Gulf of Oman and come complete with a sitting area with a sofa bed. For a maximum of 2 adults and 2 children up to 11 years, or 3 adults. In the spa area of Shangri-La Barr Al Jissah Resort ‘Chi,’ relax completely with a soothing massage so you can once again find harmony with your mind and body. The ‘Chi’ offers 12 treatment rooms, a sauna, a steam bath and a whirlpool. Shangri-La Barr Al Jissah offers a variety of sports for the entire family! The luxury resort offers a fitness center and four tennis courts, beach volleyball, mini golf, kayaking and snorkeling! The PADI diving center at the resort organizes various diving courses and unforgettable diving trips. 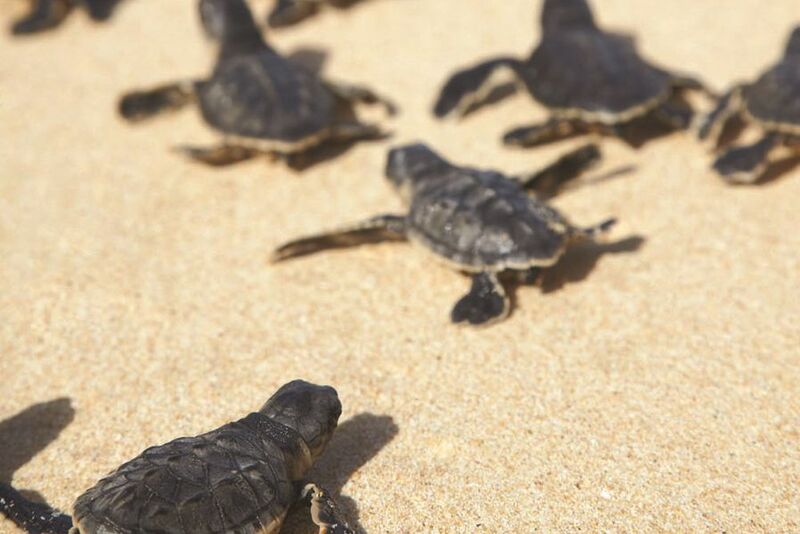 With a little luck, you can watch turtles on the beach and accompany a turtle ranger! 1) All Inclusive-Special In the travel period 01.05. - 25.06.2017, 01.07. - 31.08.2017 and 06.09. - 30.09.2017 If you book until 30.04.2017 and have a minimum stay of 3 consecutive nights reduced All Inclusive room rates (prices on request). 20% discount on treatments in the "Chi"
Please note that a copy of the marriage certificate must be presented at check-in. The specials can not be combined.